Spiritual practice is something that many start, but there are very few finalists. 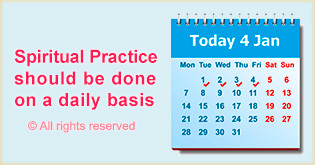 Few persist with spiritual practice for even a year and even fewer progress to higher spiritual levels. Why is this the case? It is not that there is a shortage of genuine seekers because there are definitely seekers who genuinely want God realisation. It is also not the case that Spirituality is something only a few people can make progress in. Spirituality is universal and anyone, even a bad person, can progress to God realisation with sincere spiritual practice. The reason people give up on Spirituality is because in most cases, people do not practice Spirituality as per its universal principles. When a seeker knowingly or unknowingly neglects these principles, he risks stagnation or even regression in spiritual growth. 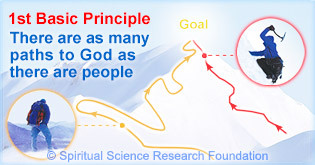 For a seeker not taking these principles into account while practicing Spirituality is like a hiker ignoring the law of gravity while climbing a mountain. With time, such seekers can become disillusioned with Spirituality and conclude that there is no truth to it. 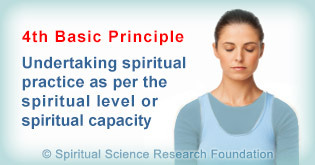 So that seekers do not waste their precious lives doing improper practices, SSRF has collated the most important spiritual principles in this section. O seekers, understand these principles, practice them sincerely and spiritual growth will be yours! 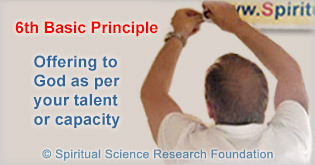 Spiritual practice is highly individual for each person. 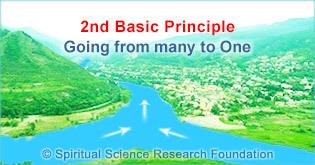 At the same time, there are some universal principles of Spirituality. If we do spiritual practice that does not conform to these principles, the practice may not lead to spiritual growth. As the old adage goes, one person's food is another person's poison. It is important to remember that each person is different and so what works for one person may not work for another. Just as an athlete focuses on one sport to excel in it or a mathematician focuses fully on one problem to solve it, so also at some point in our spiritual journey we have to focus our efforts to go ahead to higher spiritual levels. Inner love for someone is more important than a physical show of affection. So also when we love God deeply from inside, our entire behaviour resonates with the same feeling and then physical rituals reduce in their importance. We would not expect a 4th grade student to pass a 12th grade exam. Similarly, we also need to undertake spiritual practice as per our spiritual maturity. Remember when our parents gave us pocket money and how happy they were when we bought them a present with the same money? In the same way, God has given us our talents and resources, and when we offer them to serve His mission, He is pleased. Giving spiritual practice a clear definition helps us to better understand the purpose of spiritual practice. When we practice Spirituality with a clear purpose in mind, we have a better chance of success in growing spiritually. What is common between a champion basketball player and a talented pianist? The answer is sincere and dedicated practice. By putting in regular effort in any field we improve over time. The same rule applies to spiritual practice; we need to make consistent efforts to progress Spiritually. Let's take the example of the champion basketball player and the talented pianist again. They got to their respective levels of skill by increasing the amount of time they devote to playing basketball or the piano regularly. 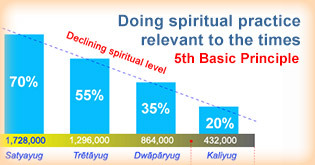 Similarly, we should keep increasing our spiritual practice in terms of quality and quantity. Would you rather eat ice cream or study the characteristics of ice cream? Just as you would likely rather eat the ice cream, it is most beneficial to put what we read about Spirituality into practice and experience it rather than only studying it. In Spirituality, words have only 2% importance while 98% importance lies in getting the experience of those words. When we start spiritual practice, in order to encourage us, God speaks to us through spiritual experiences and assures us that He is near. Due to such experiences, our faith in spiritual practice goes on increasing and our doubts go on reducing. As a result we are able to move on from intellectual banter about Spirituality to true inner experience of God. As per the current times, individual spiritual practice has 30% importance while collective spiritual practice has 70% importance. Most spiritual paths teach about individual spiritual practice, but the more important collective spiritual practice is generally neglected. Doing spiritual practice with expectations of worldly gain wastes our spiritual energy and prevents us from progressing spiritually. When we do spiritual practice without expectations of worldly gain with sincerity, God only takes care of our material needs as per what is required for our spiritual practice to continue. Would you try to win a court case on your own, or would you consult a lawyer? Or would you try to treat your illness on your own or would you consult a doctor? Spirituality is far more complex than any worldly field, so it is important to listen to someone who is an authority in Spirituality and is able to guide us in it. Most of us like to do what we want. By listening to others, however, our ego reduces and if we go on listening to others we eventually are able to understand and follow God's wish due to our ego reducing. The spiritual energy that we gain through spiritual practice is extremely precious as it is used to propel our spiritual growth. 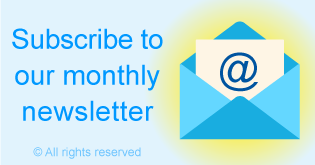 In this article we discuss how our energy can be depleted if we are not careful. It is natural to be attached to one's spiritual guide or one's co-seekers. However, psychological attachment can be detrimental to our spiritual growth. Here we discuss this aspect in more detail. In Spirituality, words have only 2% importance while 98% importance lies in getting the experience of those words. If we are serious about any endeavour in life we need to be both persistent and regular. Spiritual practice with expectation gives worldly happiness and without expectation gives Bliss. Spiritual practice gives many benefits, including a calmer state of mind, increased tolerance to stress, and Bliss. 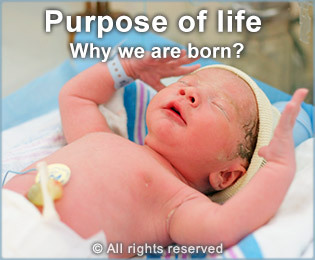 By practicing Spirituality as per the universal principles listed here, we grow spiritually. 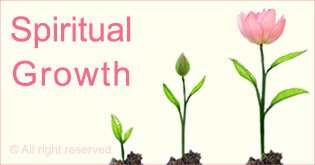 Here, we explore the topic of spiritual growth in more detail. 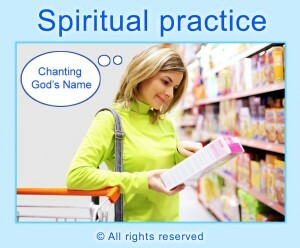 Spiritual experiences are given by God to encourage us in our spiritual practice. 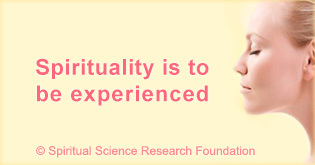 In this section we explain what are spiritual experiences and we also list some spiritual experiences of seekers.